BACKGROUND: CD31 is a key transmembrane neutrophil immunoregulatory receptor. Mesenteric ischemia/reperfusion-induced neutrophil activation leads to a massive cleavage and shedding of the most extracellular domains of CD31 into plasma, enhancing the deleterious effect of neutrophil activation. We have evaluated the preventive therapeutic potential of an engineered synthetic octapeptide (P8RI), which restores the inhibitory intracellular signaling of cleaved CD31, in an experimental model of acute mesenteric ischemia/reperfusion. METHODS: In a randomized, controlled, and experimenter-blinded preclinical study, mesenteric ischemia/reperfusion (I/R) was induced in Wistar rats by superior mesenteric artery occlusion for 30 min followed by 4 h of reperfusion. Three groups of rats were compared: I/R + saline perfusion (I/R controls group, n = 7), I/R + preventive P8RI perfusion (P8RI group, n = 7), and sham-operated rats + saline perfusion (sham group, n = 7). 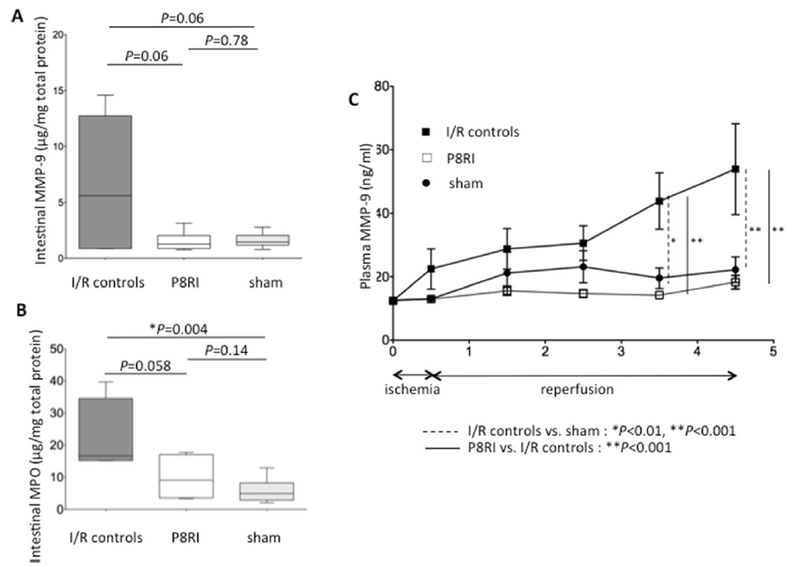 RESULTS: Compared with I/R controls, P8RI perfusion significantly decreased intestinal ischemia/reperfusion injury (Chiu’s score, P = 0.01; epithelial area, P = 0.001) and bacterial translocation (plasma Escherichia coli DNA, P = 0.04) and could limit intestinal bleeding (P = 0.09). P8RI decreased neutrophil activation assessed by matrix metalloproteinase-9 release in plasma (P < 0.001) and in the intestinal wall, albeit without statistical significance (P = 0.06 and P = 0.058 for myeloperoxydase). Inhibition of CD31 cleavage from neutrophils could play a major role in the protective effects of P8RI (P < 0.0001). CONCLUSIONS: Preventive administration of P8RI, a CD31-agonist peptide, could decrease I/R-induced intestinal injury by potentially limiting neutrophil activation.